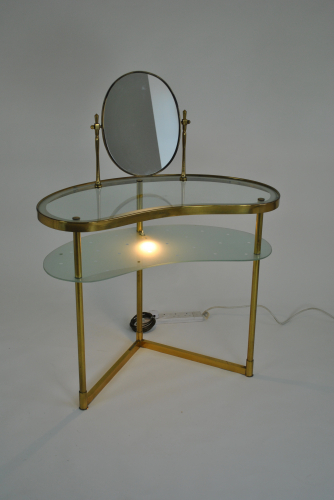 Lacquered brass and glass dressing table with stool. Brass frame and legs with 2 glass shelves - one clear ann one opaque with small clear etched circles. Adjustable mirror - takes the overall height to 120 cm. Bulb holder under the lower glass shelf provides light from below. Stool measures 37 cm high by 29 cm wide.